This afternoon I received the following email from Ms. Binita Lhaden. I don't know her but faintly remember sending a complain letter to her once regarding some trade issue. I know Ms. Binita herself will be surprised to know about this because it's not her who sent the message. Her yahoo mail account is probably hacked. The hackers will send the same mail to all the people whose email addresses are saved in her account. That's why I received the mail. 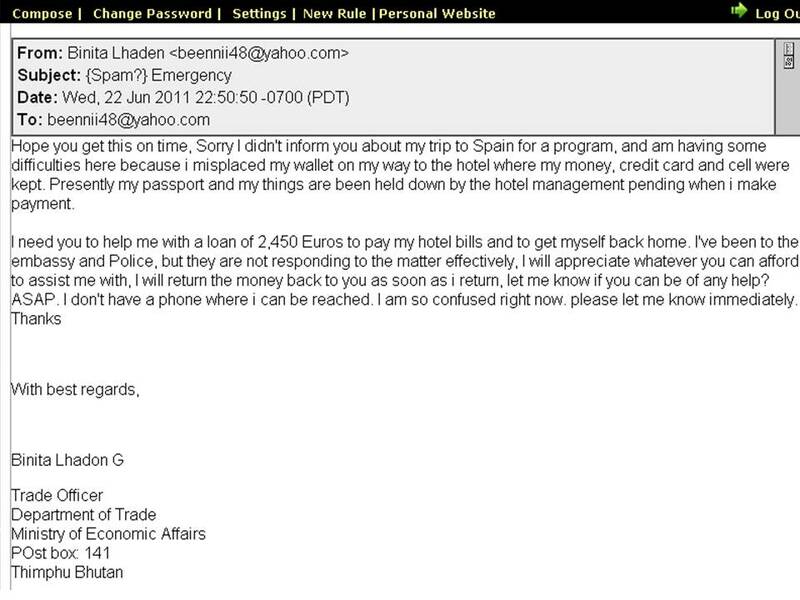 Hackers are expecting some friends of Ms. Binita to respond to her mail and send the asked money. Just respond and see how these people can fool you so convincingly. This can happen to your account also. You should be careful when typing your password on public computers. Always log out from your account while leaving. Change your password from time to time. Make your password strong-text mixed with numbers. *If any of you know Ms. Binita, please inform her (not by email though)that her yahoo account has become a beggar online and she should do something about it immediately. ha ha ha, that's interesting and also annoying... thank god sending money out of bhutan isn't so easy otherwise many of us might have fallen victim to one or the other form of internet scam. By the way, what did you brother do after he knew? The answer might help Ms. Binita and the alikes solve their problem. They are doing this for sheer scrupulous profit. 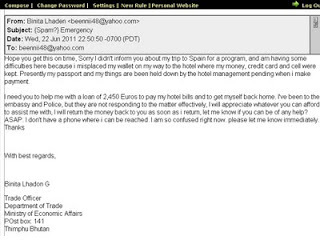 Net criminals do run a lot of scams and phishing attacks such as this.